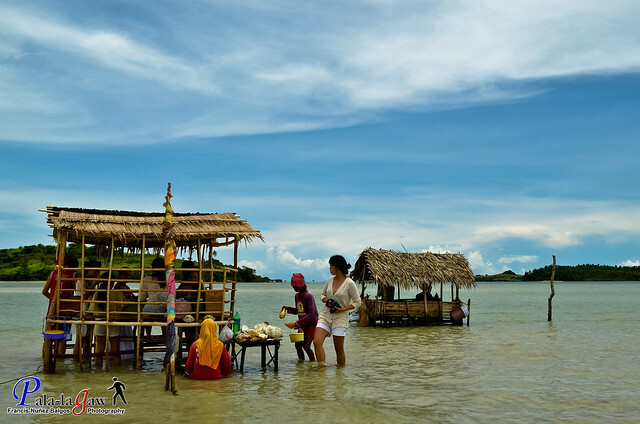 It was the second and last day of Island hopping tour, most of the islands we visited this day are too far apart in geographical location, some are even on the edge of the Pacific Ocean. Knowing this makes Caramoan all the more alluring to visit some of the most beautiful and scenic islands. It should be noted that we spent most of our time en route to our next locations, but the islands are all worth it. 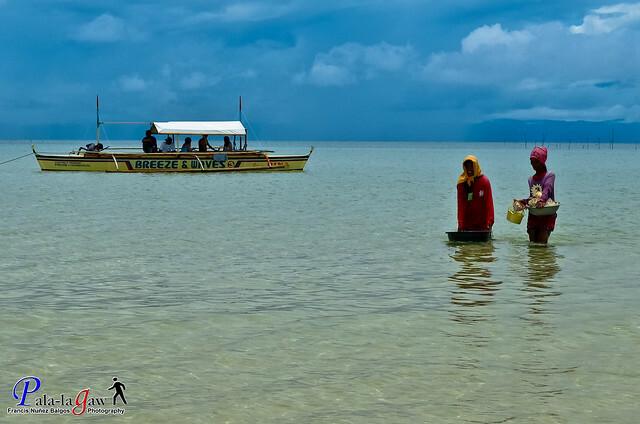 The Manlawi Sandbar begs to be different, it was the only sandbar we visited that day. We bought pack lunch from Caramoan Centro. We would've eaten our fill in one of the cottages in Manlawi but it was for a fee. So we ate it in the boat instead, I don't require fancy dining anyway. The water is already receding when we arrived in Manlawi Sandbar, the place is underwater during high tide. 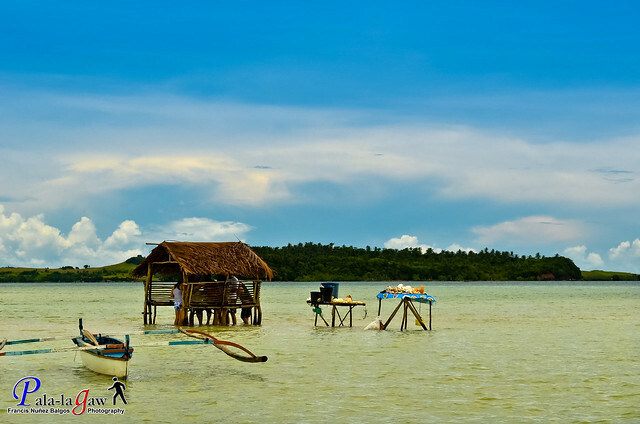 With a little patience, waiting for at least 45 minutes, the waters revealed a fine white sandbar, bounded by beautiful green hills on the south and open sea in its north. No snorkeling activity, it's was time to enjoy the sands, take jump shots, and meeting the Shell Ladies. I bought the shiny shell in the picture for Php 50.00 as buena mano for the lady. The Shell Ladies, I aptly named them simply because they sell Shell as souvenirs for the visitors. They maintain the cottages here for lunch as well, as I can imagine, they probably stay here soak up in salt water everyday. I don't fancy shells, I'd rather leave them at sea, with their host still alive. But as a gesture of generosity, I bought one, the smallest shiny shell I could find, big one's don't have a room in my backpack since I travel as light as I can. I enjoyed much of my time here in this sandbar, it's was the nicest thing since its cloudy, not too hot to be standing in the middle of a sandbar expose to many elements. The green hills seen afar is a welcome sight that I am close to solid land, and with the knowledge that if left alone stranded in this place, I wouldn't probably survive a night. The shell ladies perhaps have much more experience, considering that they stay here selling shells to tourist for a living, in the middle of Sandbar. 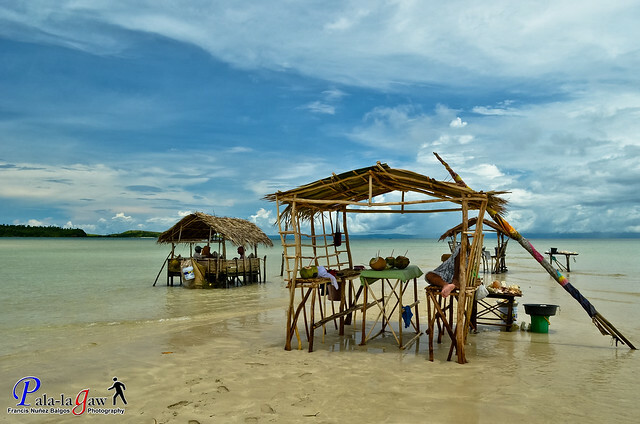 They've been photograph a lot of times too, they represent the people who lives and thrives in this Paradise Peninsula because of the influx of tourist and the work that is cut out for them by the survivor franchise. 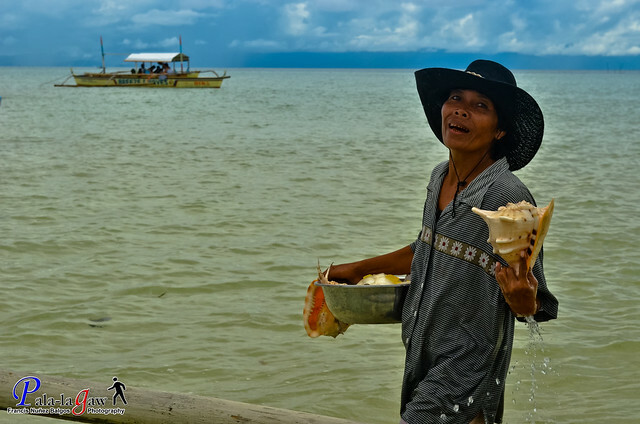 The next time you get the chance to visit Caramoan and its beautiful secluded escape islands, don't drop the chance of meeting the Shell Ladies. Love the photos! I heard that it takes a lot of time and traveling to get to that point of Caramoan. Is it really that far? Aw, very nice view...Parang gusto ko na agad maligo jan... I have that kind of shell from Samar. Manlawi Sandbar is gorgeous. I have not been to Caramoan, but I have plans to visit it soon. Love the photos of the place and the shell ladies. 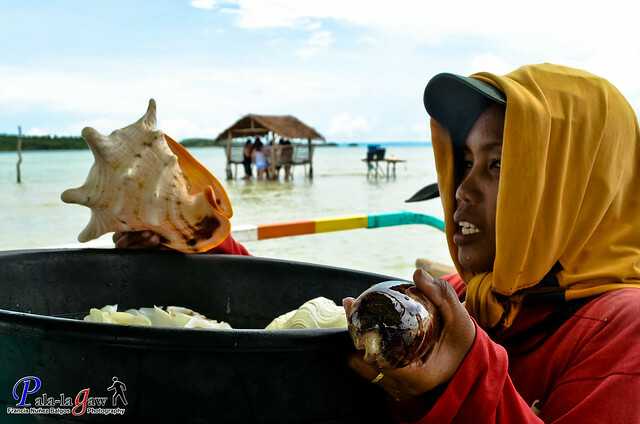 I also loved the fact that the locals have a source of income through the shell souvenirs, and it wasn't monopolized by a private company. Sana ma-maintain nila yung simplicity ng place. I miss this place! Hope to go back to Caramoan soon! ahehe... inggit mode.... taking note of kuya ramil's link for the future! one of the many places here that i so want to visit...love your photos. I'm sooo jealous! Caramoan's so elusive to me. Hope I finally get the chance to visit this year. wow! i love the 4th pic. i like the shell the lady was holding. wish i could see it in person.. I love Caramoan! Although hindi namin napuntahan yang part na yan. Di bale may next time pa naman. Buti pala hindi close yung ibang islands nung pumunta kayo? I heard na mayron daw ngayon shooting dun ng survivor eh.